Imagine having a volunteer open a telephone book randomly to any page and selecting any telephone number and all of this without any force or any mathematical formula and you reveal the chosen number! These are just a few of the ideas that can be utilized to actually reveal the thoughts of a volunteer. 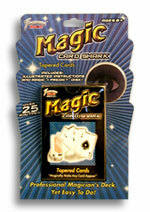 Includes a "0-9" number deck of 50 poker-size cards. Simply enter your details below and we will send you an e-mail when “MENTAL NUMBEROLOGY by Harvey Raft - Trick” is available to ship!